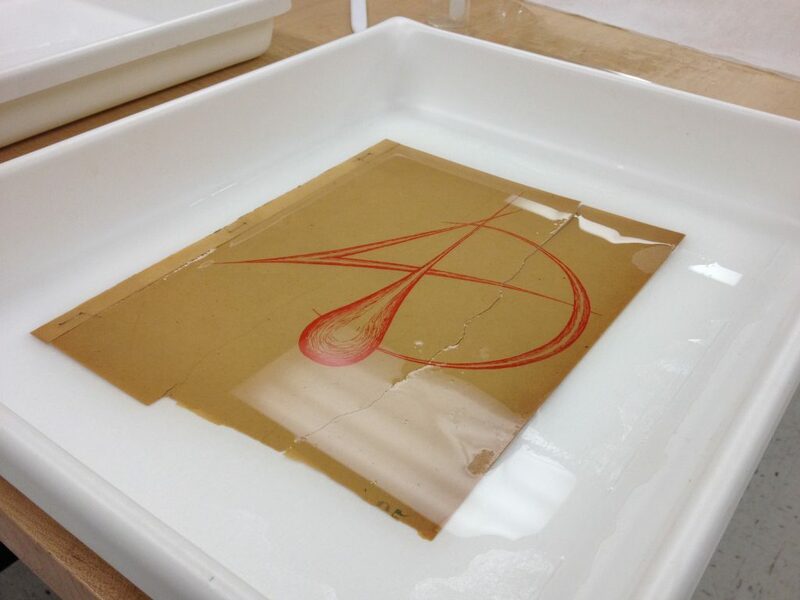 Conservators do their best to inflict as little change as possible on the items they treat. Sometimes this rule is straightforward; at other times, an object can present a crossroads in decision-making in which the ethics are hazier. Which path is least invasive? Which is more reversible for future treatment? Which will provide the most stability? Which will present the most “truthful” version of the object and be the least destructive to its history? The chosen treatment can have great effects on future audiences’ understanding of an object. 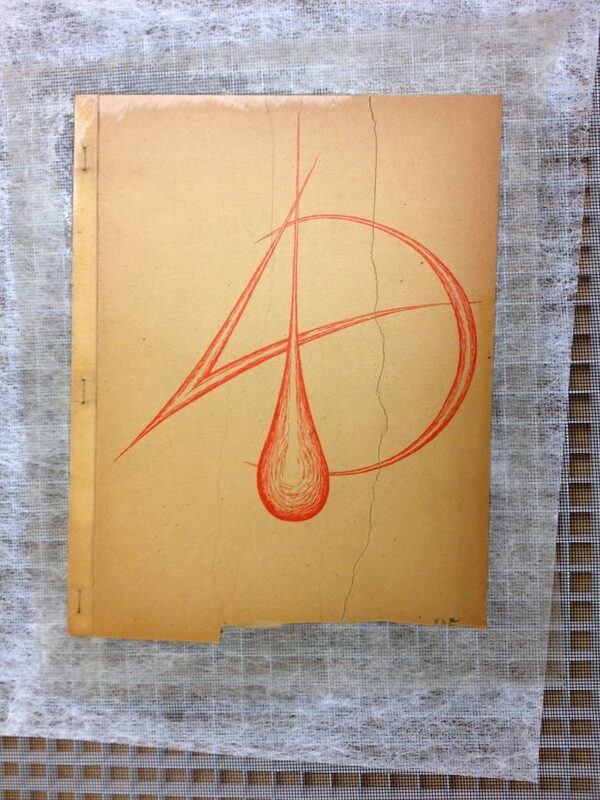 We recently treated an object that presented such a quandary. R. Buckminster Fuller, much later in life. 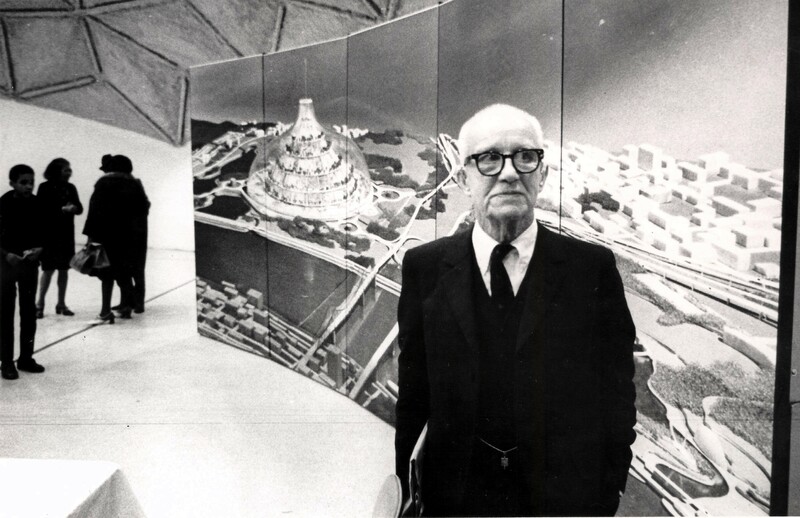 With that as his driving motivation, Bucky Fuller set out to find just how, exactly, he would change the world. His work with Stockade had given him some experience in construction, and he decided to make the homebuilding industry his first target for revolution. 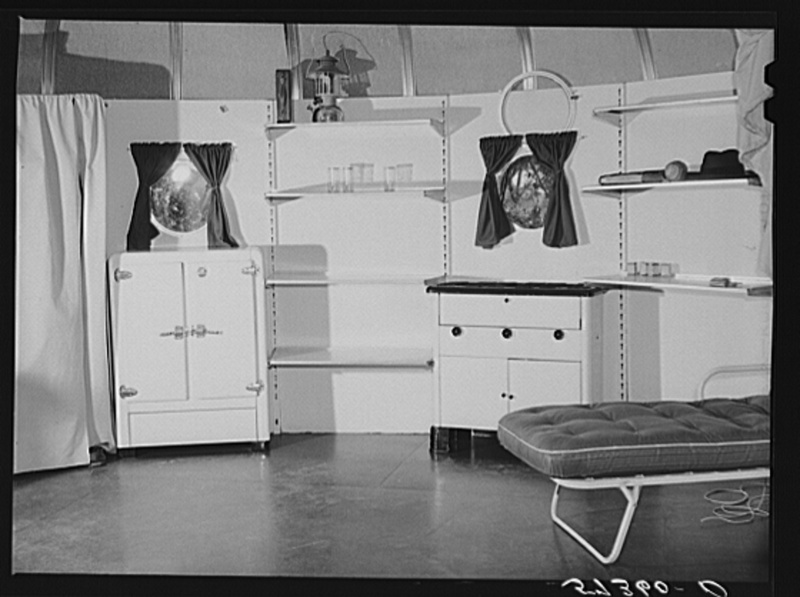 He spent several years developing the 4D House (also known as the Dymaxion House), which he envisioned as a fully premade home that would require no separate plumbing or wiring, and could simply be purchased and delivered at a relatively low cost. Only two formal prototypes were ever made; one survives at the Henry Ford Museum in Detroit. The McCormick Library of Special Collections at Northwestern possesses a copy of this original manifesto. 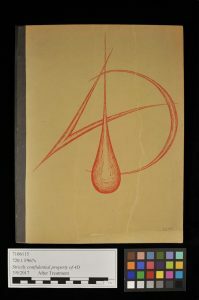 This particular copy was received by Arthur Holden, an architect who had worked previously at McKim, Mead & White before co-founding his own firm (Holden, McLaughlin & Associates) in New York. He had also published a book that young Bucky was probably interested in: Primer of Housing (1927). 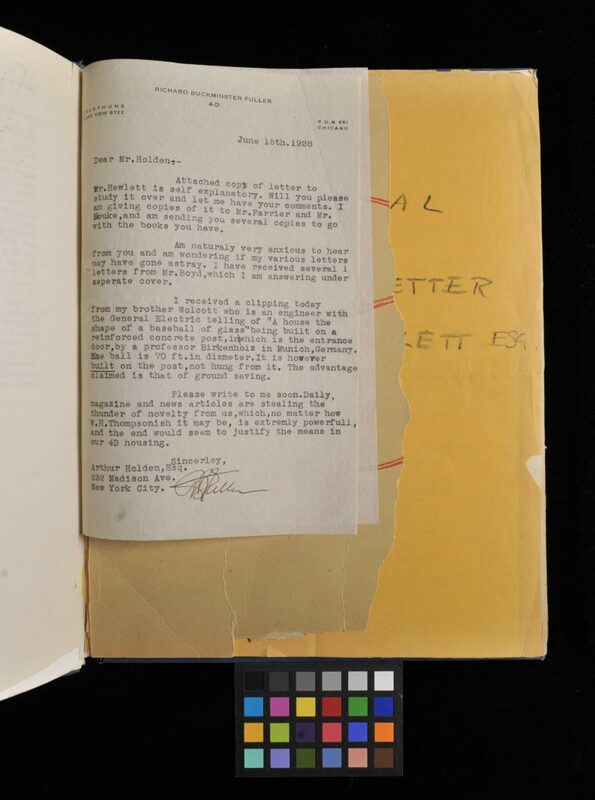 Holden and Fuller corresponded about his essay and potential publishers, though nothing came to fruition, and much of Bucky’s correspondence expresses his frustration with Holden’s lack of urgency. 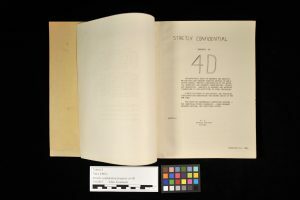 In 1975, after Buckminster Fuller had become a well-known name, Holden must have realized that the copy of the 4D essay he possessed was actually worth something, as he had it bound up along with all his correspondence with Fuller. 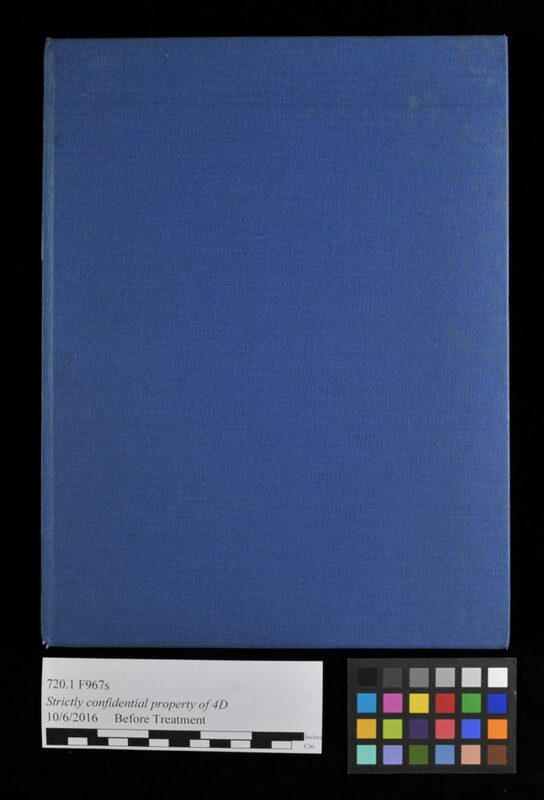 This is how the book appeared when it came down to Northwestern Libraries’ conservation lab: the original staple-bound essay, glued up with correspondence leaves (as well as an extra copy of the essay’s appendix), and cased in with boards covered in blue buckram. 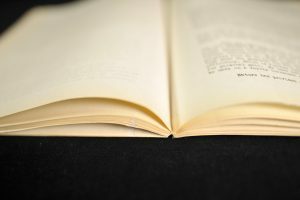 By 2017, the paper’s increasing acidity, combined with the conflicting structure of the 1975 re-binding, had caused the book to fall into disarray. 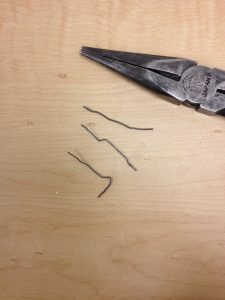 Staples, which were found in the essay, appendix, and a letter, had formed a breaking edge a half inch from the spine. 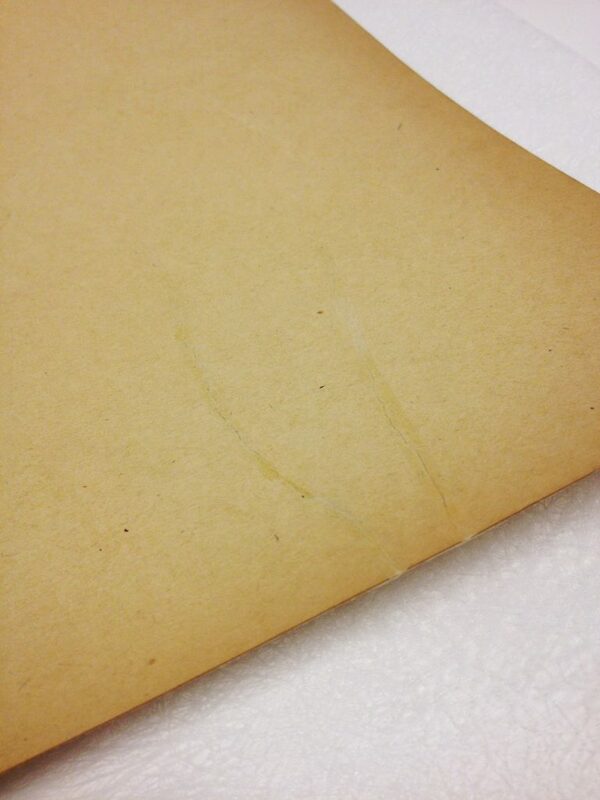 The covers to the essay, which also appeared to be acidic, had broken apart. The glue applied to the spine by the 1975 binder had seeped into the gutters, making page-turning hazardous. 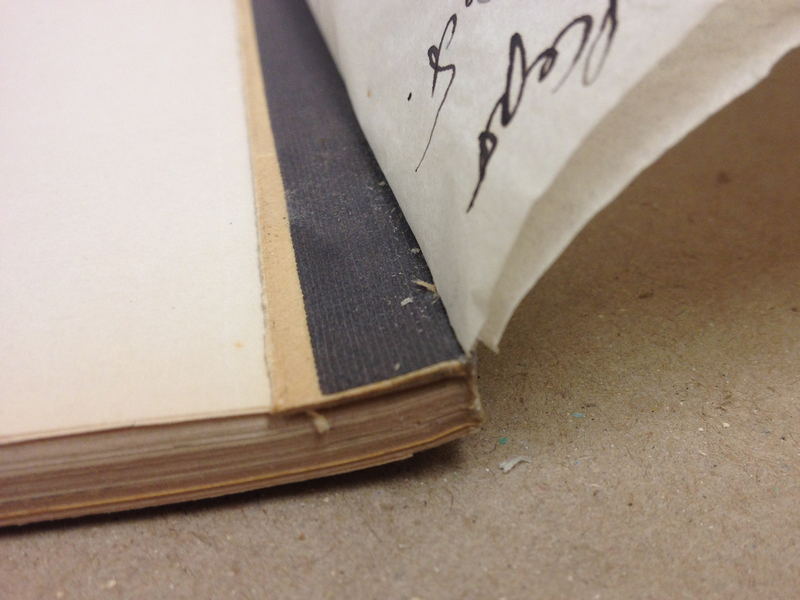 The book had to be handled with utmost care to avoid further damage, and deciphering the contents was confusing. 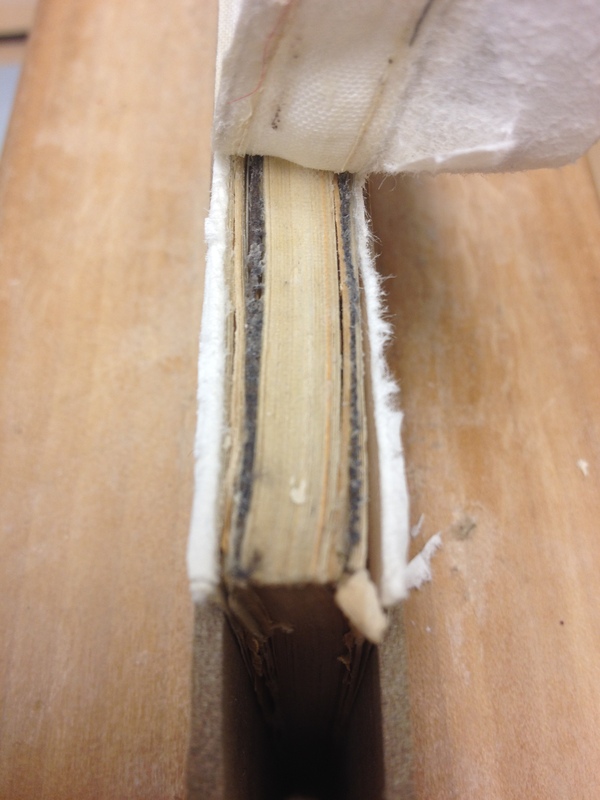 The cloth spine-lining is removed; gellan gum was used to introduce moisture and soften the adhesive. We were presented with a binding with two moments of creation separated by fifty years. 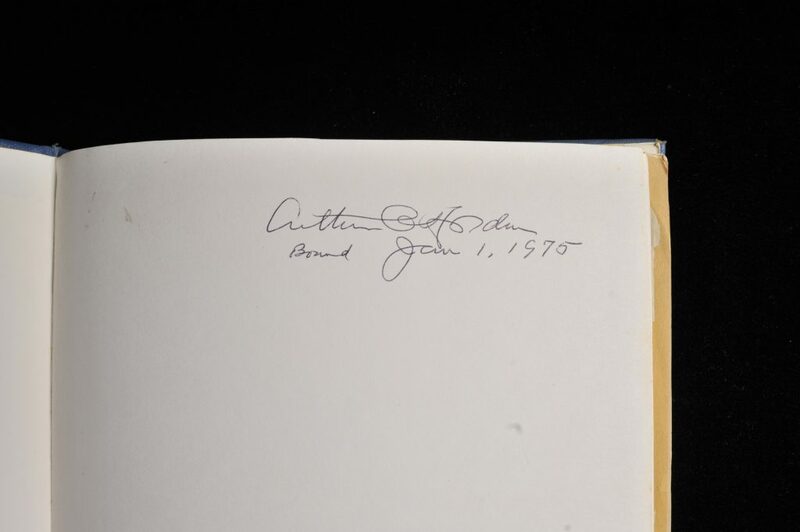 A judgement on the value of these two iterations had to be made in order to begin treatment: the book could simply be stabilized and treated in situ, or the 1975 binding could be sacrificed to better treat its contents from 1928. The 1975 binding was deemed both less important and exceedingly damaging to the more valuable contents. The decision was made to remove the case and separate all contents. The 1928 staples were also deemed damaging and less important than the textblock paper. 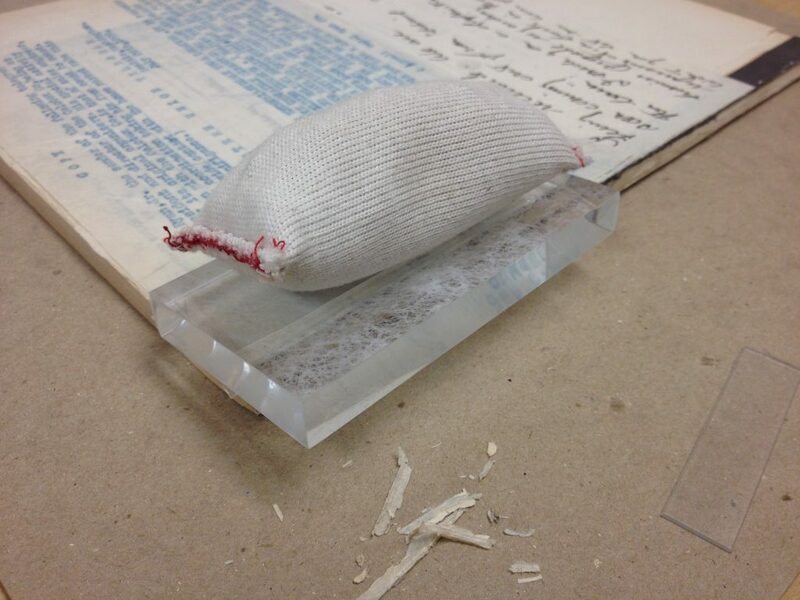 It was assumed that, once the staples were removed from the essay, the contents would come loose, as it was loose-leaf to begin with (rather than in folded sections). 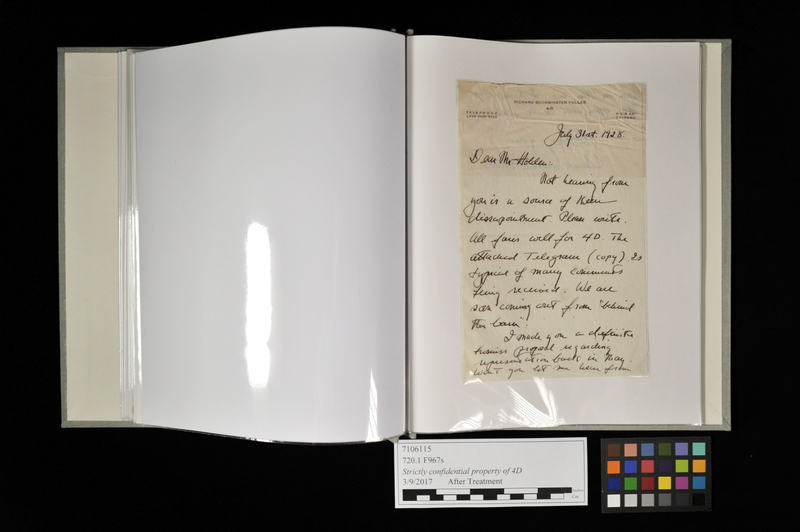 Without a means of rebinding, the plan was to transfer the leaves of the essay into polypropylene sleeves and bind them into a scrapbook, along with the leaves of correspondence. Gellan gum is used to soften the adhesive holding the correspondence leaves together. This was not the case, though. 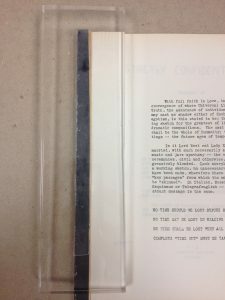 Following the removal of the 1975 binding, a spine lining, the correspondence leaves, and the 1928 staples, the loose leaves of the essay still held together. 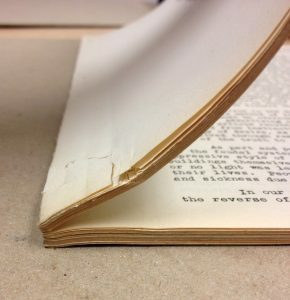 The 1975 binder had removed the essay’s cloth spine and applied a significant amount of glue (likely a polyvinyl acetate or “white glue”). 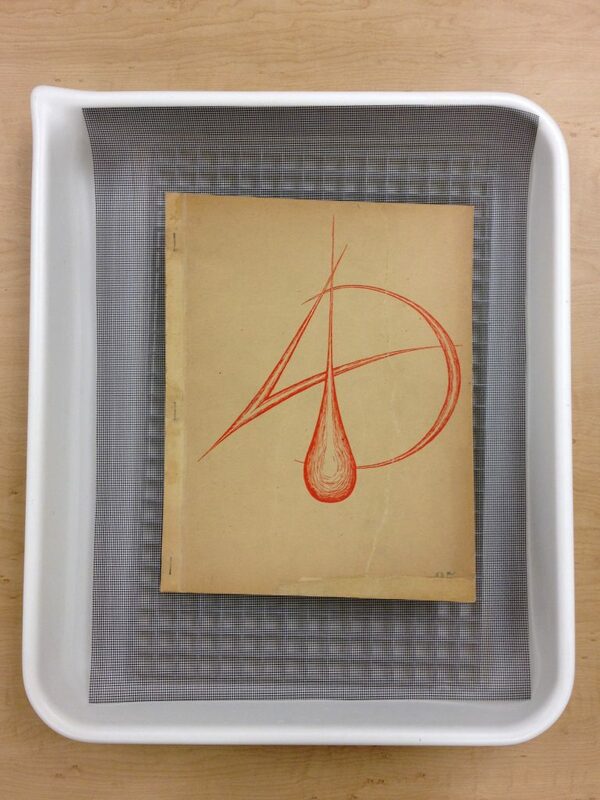 This was enough to turn the essay into an “adhesive binding,” similar to a typical paperback. Without the staples, the pivot point of the leaves moved to the spine edge, relieving stress from the breaking areas. 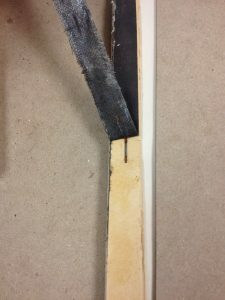 The spine-opening following removal of the staples. So a new treatment option presented itself. Using this “adhesive binding” as its new structure, the essay could be rebuilt to resemble what Bucky originally created. This option would place the value of a cohesive, “truer” version of the 4D essay over the protection provided by polypropylene sleeves. Post-bind the entirety—including the essay pages and cover papers—in polypropylene sleeves within a post-binding. This would involve deconstructing the adhesive-bound essay textblock. The essay cover papers would be treated like the other leaves. Post-bind the correspondence and rebuild the essay’s binding. 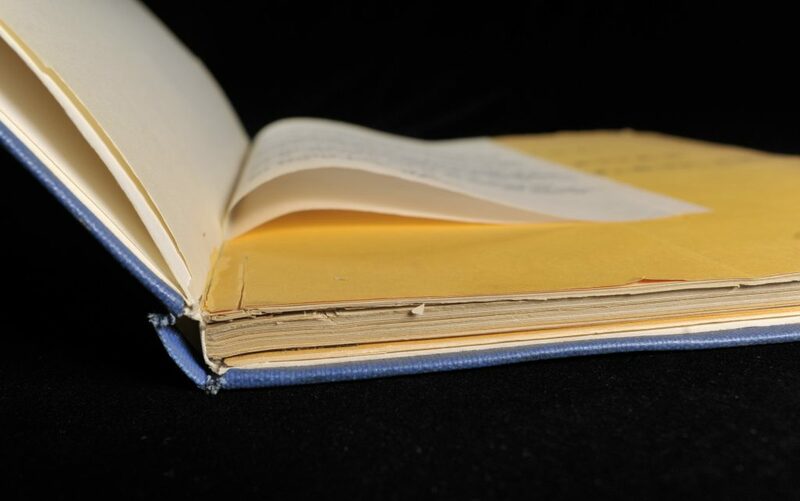 This would involve reinforcing the existent adhesive by adding a small amount of new adhesive, repairing the cover papers and replacing the black cloth that had served as the original spine of the essay. Option 1 presents the more stable route: every leaf could be safely stored in a sleeve with an alkaline backing sheet to inhibit further acid-induced degradation, and the paper would no longer be subjected to hinging and breaking. 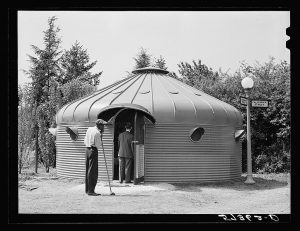 But it is also the more invasive route: it would greatly disrupt the aesthetic nature of the bound essay, and the final product would look nothing like what Bucky Fuller himself produced and mailed out to friends and colleagues. Option 2 exposes the leaves of the essay to greater risk. Though the movement of the leaves would rotate at the spine edge, the leaves would still be subjected to some flexing and will continue to degrade. The adhesive binding may also eventually fail with a high volume of usage—though, since the library also holds the 1970 edition, this copy is more valuable as an artifact than as a document to be read. This option is far less invasive and doesn’t require disassembly of the textblock, therefore posing less risk during treatment. The aesthetic and dynamic qualities of the original would be restored, and the object would be better understood by future users. We chose option 2, preferring the less invasive treatment. 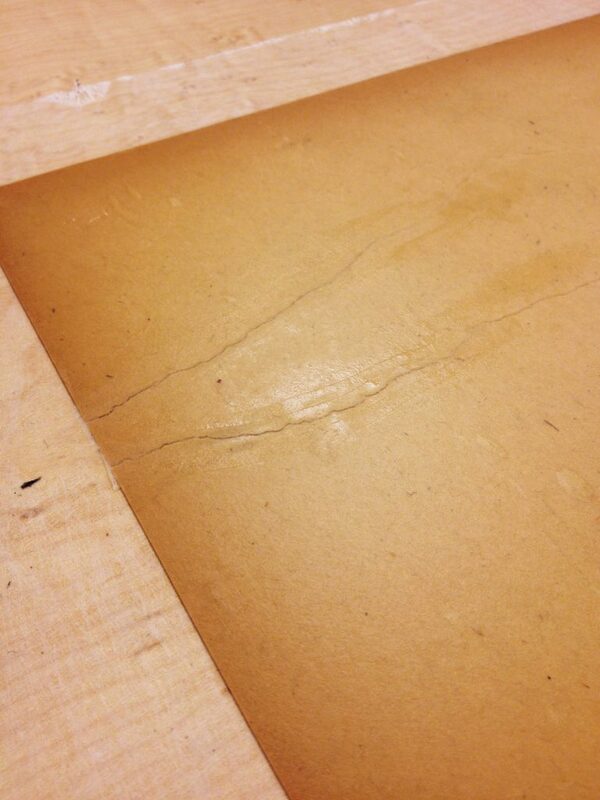 The tears throughout the text-block were mended, and the cardstock cover papers were washed, lined and mended. The spine was rebuilt using a heavy, color-matched Japanese tissue, and the surviving fragments of the original cloth were re-adhered overtop of this. The opening action of the essay after treatment. 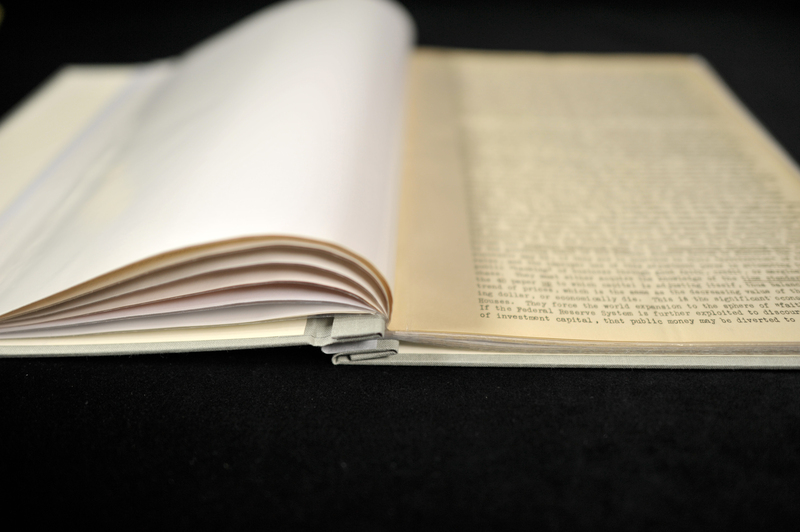 A post-bound portfolio was fashioned to house the leaves of correspondence in their polypropylene sleeves, and a two-tier clamshell box was made to fit both the bound essay and portfolio. 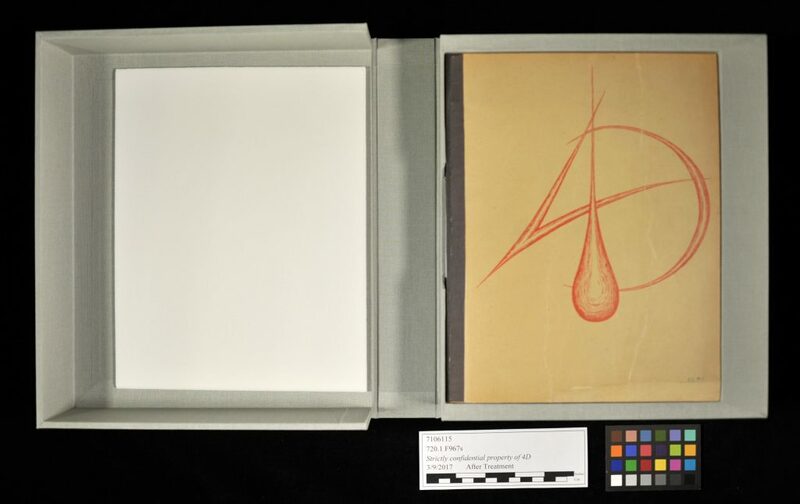 Lascaux 498-HV was used (rather than poly vinyl acetate) to avoid creating an acidic environment for the contents, and the box interior was covered with alkaline-buffered paper. 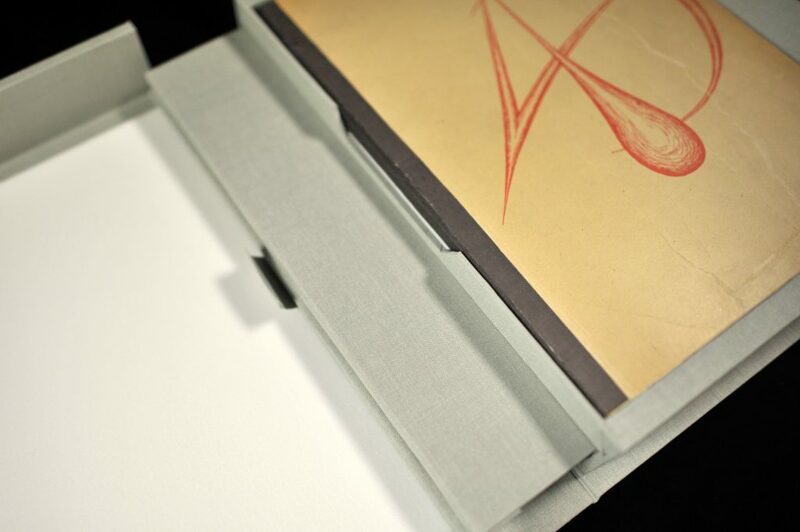 The post-bound portfolio made to house the leaves of correspondence in polypropylene sleeves. The post-bound portfolio. 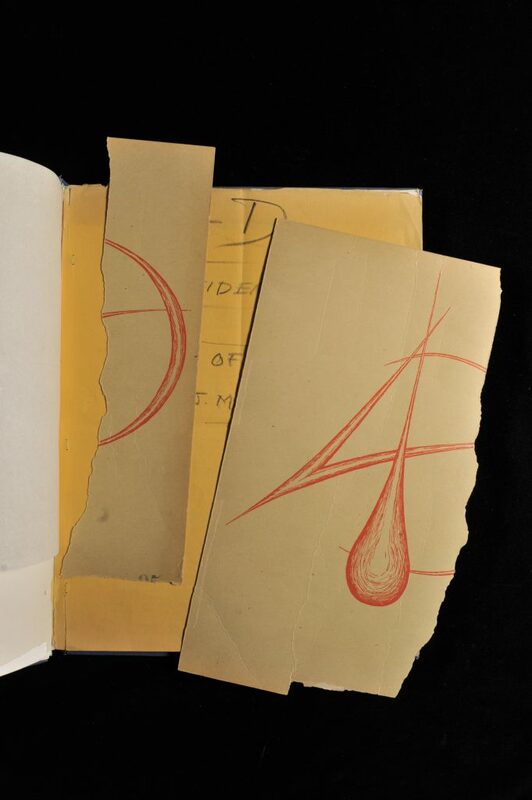 This page shows a handwritten letter from Bucky to Arthur Holden, composed on Bucky’s “4D” letterhead. Bucky’s essay and correspondence are much more accessible in their new home, and the essay’s aesthetic and dynamic values have been restored. With cautious handling, the materials will last for many decades more. We’re happy with our decision. Fuller, Buckminster. 4D Timelock. Albuquerque: Lama Foundation, 1970. Krausse, Joachim and Claude Lichtenstein, eds. Your Private Sky: Buckminster Fuller; the Art of Design Science. Baden: Lars Muller Publishers, 1999. Lorance, Loretta. Becoming Bucky Fuller. Cambridge, MA: Massachusetts Institute of Technology, 2009.